Narrow Escapes! covers the period of Miloslav Bitton’s life from 1919 to 1949. The book begins with family life on the farm in the Ukraine where he was born on 14th October 1919, and later in Czechoslovakia where the family lived from 1926. At age 14 Miloslav began an apprenticeship – and later employment – in the grocery business in Bratislava, and in 1938 committed to four years’ study at the Commercial Academy in Bratislava to improve his prospects. By the end of his first year at college, however, Slovakia had become a puppet state of Germany and World War II had begun. In September 1939 Miloslav was approached to organise a clandestine escape route into Hungary for Czech military personnel trying to get to France via Yugoslavia; in the evenings after college he would accompany parties of up to 8 people – by train and on foot – to within 400 metres of the Hungarian border where he instructed them where to cross and how to purchase train tickets for Budapest. By January 1940, however, Miloslav’s illegal underground activities had come to the attention of the border guards and on 19th February he had to make his own escape. Following his safe arrival in Budapest, Miloslav continued his activities helping escapees reach Yugoslavia until arrested by the Hungarian Secret Police. Although severely beaten he gave nothing away, and in April was returned to Slovakia. Undaunted Miloslav journeyed again to Budapest and this time managed to reach Yugoslavia. His onward journey took him through Greece, Turkey and Syria to Beirut. By this time, however, France had capitulated and the Lebanese border was closing. 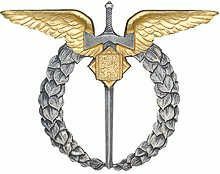 Miloslav found his way into Palestine where he saw action in the Middle East with the Czechoslovak Infantry Battalion No. 11 – East and the 200th Czechoslovak Light Anti-Aircraft Regiment – East. In June 1942 Miloslav answered an appeal from the Czechoslovak Air Ministry in London for volunteers to join the Royal Air Force, and on New Years’ Day 1943 Miloslav landed on English soil. He was sent to Calgary in Canada to train as a fighter pilot, and in January 1945 received his posting to 310 (Czechoslovak) Fighter Squadron. His first assignment took place on 7th February when the Czechoslovak fighter squadrons provided top cover to one hundred and fifty Lancaster bombers during a raid on Dortmund. Returning from an aborted operational sortie on 2nd May, Miloslav experienced engine problems and crashed in Surrey. Pulled out of the plane by a local farmer and his farmhands shortly before the plane burnt out, in hospital he was found to have dislocated his neck and was put into a plaster which covered most of his upper body. It was not until 12th September that Miloslav had his final medical check and was classified fit for full flying and ground duties again. Miloslav returned to Czechoslovakia with his English sweetheart, Joan Bitton, who he had married on 3rd April. 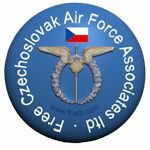 They set up home in Prague where Miloslav continued with his service in the Czechoslovak Air Force at Kbely Air Force Base, and on a part-time basis completed the course at the Commercial Academy in Prague which had been interrupted by the war. Their circle of friends grew, particularly amongst the Air Force personnel who had English wives, but at Kbely life became more strained with the introduction of new regulations and a political culture began to permeate the military establishments. Matters came to a head early in 1948 when all ex-RAF flying personnel were denied access to the airport area at Kbely being classified as “unreliable elements”, particularly those who had married British or other foreign girls. Miloslav and Joan decided they had to leave Czechoslovakia; Joan and their young son would have no difficulties but Miloslav was still serving in the armed forces and could only leave illegally. His luck held and on 26th March he crossed the border safely; for 2 months he was a “displaced person” in Germany until his British visa was granted on 4th June – following intervention by Joan with the Home Office! 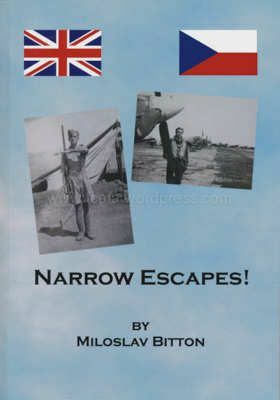 An intriguing and interesting book with narrative enlivened by vivid descriptions which give a fascinating insight into Miloslav’s childhood in the Ukraine and Czechoslovakia, and of his daily life whether conducting clandestine operations, undertaking war-time service in the Czechoslovak Army and the Royal Air Force, or of his life in post-war Prague until the communist coup in 1948 and his subsequent escape. This entry was posted in 310 Sqd, Books. Bookmark the permalink.